Claim: There’s no evidence that the global climate is warming. Why worry about a problem that’s invisible? Fact: Just about any aspect of climate you care to look at does show signs of global warming. The US National Oceanic and Atmospheric Administration have recently released their 20th annual State of the Climate report. The report is ostensibly about the climate in 2009, but because 2009 was the end of a decade the authors decided to take a longer-term view. draws on data for 10 key climate indicators that all point to the same finding: the scientific evidence that our world is warming is unmistakable. More than 300 scientists from 160 research groups in 48 countries contributed to the report, which confirms that the past decade was the warmest on record and that the Earth has been growing warmer over the last 50 years. I haven’t read the full report (it’s 200 pages long), but I have read the very accessible 10-page summary. It examines the trends for the aforementioned 10 climate indicators using a total of 47 different sets of data. 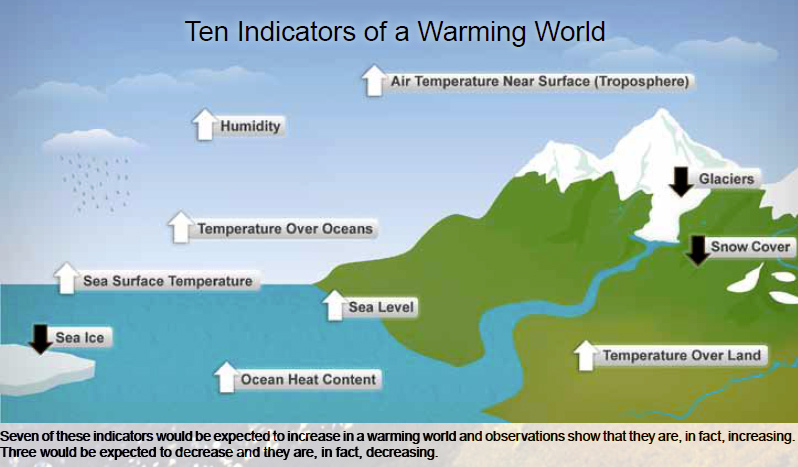 As shown in the diagram at the top of this page, all of the indicators expected to increase in a warming world, are in fact increasing, and all that are expected to decrease, are decreasing. Although contrarians often try to frame the climate discussion as being about land surface air temperature as measured by weather stations, it was only one of the indicators used by NOAA in this report. They also looked at sea surface temperature, air temperature over the oceans, and the temperature of the lower troposphere. In fact, by just about any measure, temperatures are rising — the one major exception being in the stratosphere, which is expected to cool and accordingly is cooling. Although temperature is the most obvious thing to watch, Arctic sea ice, glaciers, ocean heat content, sea level, and humidity are all moving in the direction predicted by the global warming hypothesis. The 2000s was the warmest decade globally, and each of the last three decades has been much warmer than the previous one. Although the 1980s was the warmest decade at the time, every year of the 1990s was warmer than the average temperature of the 1980s, and every year of the 2000s was warmer than the average temperature of the 1990s. In the last 50 years the Earth’s surface has warmed by about 0.6°C, and we are already seeing the effects. More than 90% of the extra heat from global warming is going into the oceans, because water has a much higher capacity to absorb heat than does air. Most of the increase in ocean heat content has been in the upper oceans, but heating has also been observed as far down as 2 km. The thermal expansion caused by this heating is partly responsible for the observed sea level rise. The IPCC conclusion that “warming of the climate system is unequivocal” does not rest solely upon LSAT [land surface air temperature] records. These constitute only one line of evidence among many, for example: uptake of heat by the oceans, melting of land ice such as glaciers, the associated rise in sea level, and increased atmospheric surface humidity. If the land surface records were systematically flawed and the globe had not really warmed, then it would be almost impossible to explain the concurrent changes in this wide range of indicators produced by many independent groups. The observed changes in a broad range of indicators provide a self-consistent story of a warming world. I recommend that people read the 10-page summary — on page 3, there is a nice clear graphic showing the trends for all the different indicators. You can also look at the differences between datasets for each indicator here. You can find previous posts in my ongoing series debunking the arguments against global warming here. :-Mankind can change the climate. I say there is no empirical proof to to support either of those assertions, but there are a number of factors that disprove them. If you know what empirical proof is and you come up with some regarding the above assertions, I am all ears. Roger, I suggest you read Skeptical Science’s “10 Indicators of a Human Fingerprint on Climate Change”. Been there done that, and I must admit he reads well, but when you look at it very carefully, he is still relying on theoretical models that are tweeked to fit the observations. Correlation is never proof, and models that assume the AGW hypothesis as their basis prove even less. In other words I found nothing empirical at skeptical science even though I asked them some very searching questions, most of the answers were ad hominem attacks. I will concede that it is well written though and may convince some people. You’re wrong. Every one of the ten “fingerprints” mentioned on that page is empirical evidence. The ten finger prints quote no doubt very good empirical evidence for each observation, but what is sorely missing is empirical evidence of the causation. Furthermore, each observation, in fact all of them together can be explained by a number of other hypothesis which also cannot be disproved. Like I said, I have been there done that with that site and all they have is observations, not causation. What do you mean, no evidence of causation? Let’s take the first item on the list: “Humans are currently emitting around 30 billion tonnes of CO2 into the atmosphere.” Gee, I wonder what’s causing that? Oxygen levels are falling as if carbon is being burned to create carbon dioxide; fossil carbon is building up in the atmosphere; corals show it has recently risen sharply; less heat is escaping to space at the precise wavelengths which CO2 absorbs; this heat is returning to Earth to warm the surface; nights are warming faster than days; the stratosphere is cooling; the tropopause is rising; and the ionosphere is shrinking. All of the above are indications that humans are causing global warming. This is the hole in the AGW argument. It may well be that all these observations you mention are true, although some will argue that point. The point is that you have a number of events happening and there appears to be some correlation. The trouble is that, as any first year student of statistics is told, correlation does not prove causation. The essential point being with AGW is that we are bombarded with observations and any correlation is prominent emphasised here as well, but they are very weak on causation. Only the weak minded or ignorant will be satisfied with such logic and in fact there are no empirical causation studies or proof of AGW whatsoever. On the other hand, there are also a number of other hypothesis which are not disproven, that explain the current warming trend. Looking at your comment above. It proves that humans are emitting co2 into the atmosphere. It does not prove anything else. Similarly all the other things you mention are no more than observations – in essence they show the planet is warming. What does that prove? It proves that the planet is warming. Causation is the supposed link between the two events. This is the essence of things and this is what you should look for. I don’t think I can explain it any more clearly than that. The first four pieces of evidence show that humans are raising CO2 levels. Numbers five and six show that CO2 is trapping more heat. Numbers seven through ten show that the pattern of warming is consistent with the pattern predicted to occur when warming is due to the greenhouse effect. For instance, if the warming was due to solar activity, the stratosphere would be warming; but greenhouse warming means that the stratosphere cools, and observations show the stratosphere is cooling. And where is the empirical causation in all this? Once again you are quoting observations. Interesting your comment about the stratospheric cooling though.